Ride-on toys can be so much fun and just like the older kids, toddlers would also love to ride around and get a feel of what the bigger children are getting a kick from. 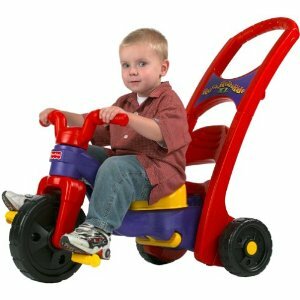 An excellent gift for little ones from age 1 and up, the Rock, Roll n Ride Trike from Fisher Price, is a toy to consider. It comes with a very reasonable price tag considering just how durable it is. And because of its big enough size, this ride-on toy can certainly be used for some time. Whether for a birthday gift, for Christmas, or simply to present your little one with something special because he is special, this is one toy that will surely make his eyes light up. 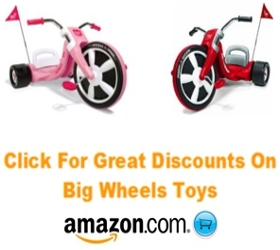 There are a number of things parents always need to consider when purchasing tricycles and other ride-on toys for toddlers. The first thing of course is how safe and sturdy the toy is. There are trikes that feature lower gravity points, as well as those with extra features that can keep them from tilting over. Then there is the durability of the toy, which is based mainly on the type of material used for constructing it. This adds to the safety of the toy, as well as the duration of time that it can last. Another factor to consider is how long a toy can be used by the child. Lastly, parents do consider the issue of storage, especially when living in homes that do not have enough space for storage. The Rock, Roll n Ride Trike has been receiving a lot of positive reviews from parents, which means that it has met their special standards. It must also be because they see how happy their kids are with this trike. The simplicity of using the Rock, Roll n Ride Trike is one important aspect that makes it quite popular. A child simply needs to get on the trike and he’s on his way. When it comes to safety, this ride is indeed safe and sturdy as well. It certainly does not tip over, which could cause a child to get hurt. However, toddlers may need a little assistance getting on and off the trike until they are used to it. Durability-wise, the toy is well-built and made to last. Parts falling off are not a problem, and the trike is able to withstand rough riding as well.